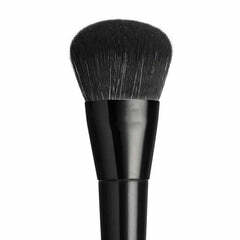 Awaken your natural beauty with this professional angled eye kabuki brush. Perfect for applying and blending concealer, you’ll love applying your makeup with a high level of control. You can also use the brush for contouring the nose and cheeks to add dimension. The brush is made of cruelty-free vegan bristles with an incredible soft feel, which is gentle on your skin. 19cm full length. Bristles - 1.7cm high, and 1cm wide.